Tomatoes Provencales are a French summer tradition, that uses garden fresh herbs and perfectly ripe tomatoes that sing with flavor. I first met Susan seven years ago at one of her culinary classes at On Rue Tatin in Paris. We became instant friends. I loved her contagious passion for food, her vast culinary knowledge and her commitment to seasonal, local fresh food, which she highlights in every class, she teaches and every recipe she writes. All are evident in her latest book, FRENCH GRILL. I didn’t realize grilling was a French thing, let alone a woman thing, but Susan proved both to be false. 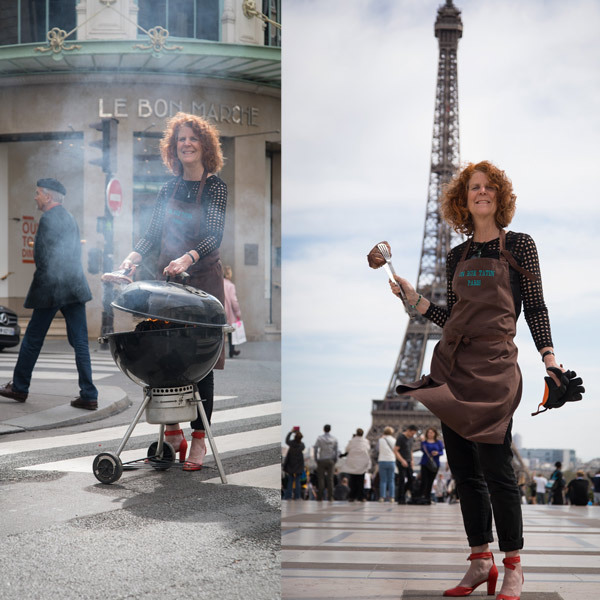 She grills at the drop of a hat, and one of her funniest stories in FRENCH GRILL is how she manages to teach her French male friends that yes, women can take the tongs, tame the fire and produce amazing food! The French really do have that savoir-faire thing going on. Susan loves to turn up the heat where ever she is. Last time I was at Susan’s house she grilled our dinner and it was so delicious. 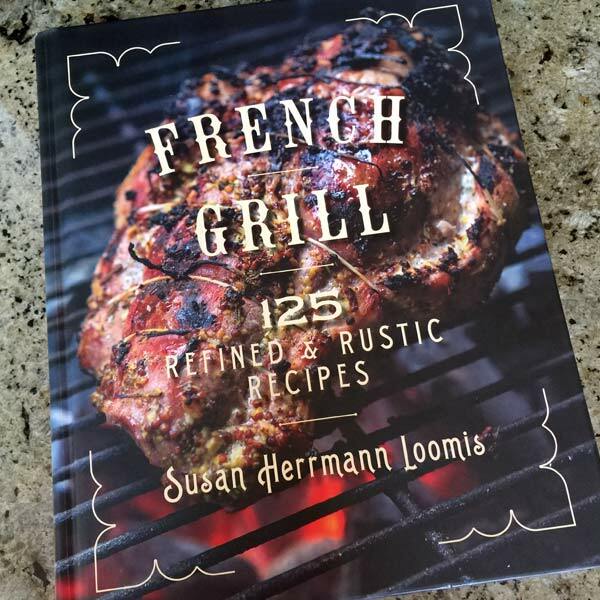 In FRENCH GRILL, Susan takes a humorous and very practical approach to grilling that makes it seem so easy that now all I want to do is grill everything! 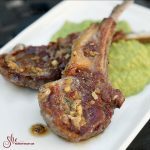 In FRENCH GRILL she gives a whole new look at grilling that has everything to do using the best ingredients, giving them light treatment, and letting their flavors shine through. 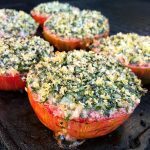 She also talks about all aspects of grilling with gas or charcoal, she addresses safety and health, demonstrates techniques and urges her readers to rely on instinct and intuition to get the most flavor out of every ingredient. Pretend that you are French, and think local and seasonal when you’re buying ingredients for the best flavor, best economy, and smallest carbon footprint. All food is first about the quality of ingredients. Once you have the best you can find, get out of their way, keep things simple, follow her instructions and you’ll have the most successful grilled meals in the neighborhood. Give food the “kiss of smoke” which will enhance flavor, not bury it. The recipes in this book impressed me with their simplicity. They’re straightforward and doable, and Susan gives the added bonus of tips and tricks to make things go even more smoothly. Here are just a few that I have tried. 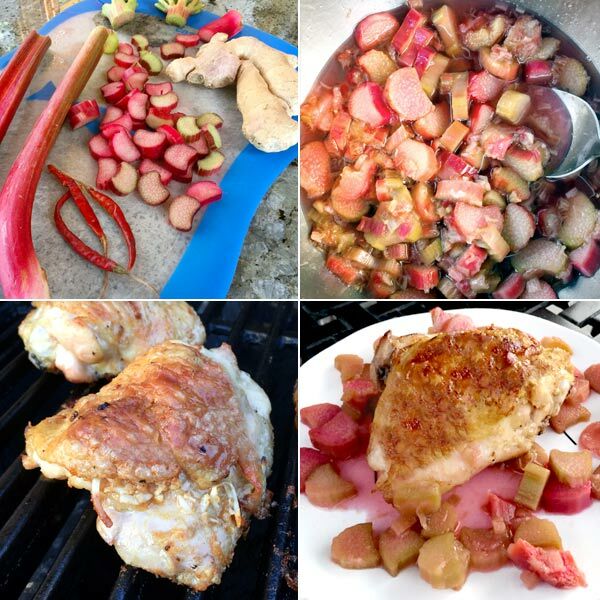 We were all surprised at how amazing this savory-sweet chicken with rhubarb dish is. I have made it so many times, and I love to impress company with its bright flavors and colors. 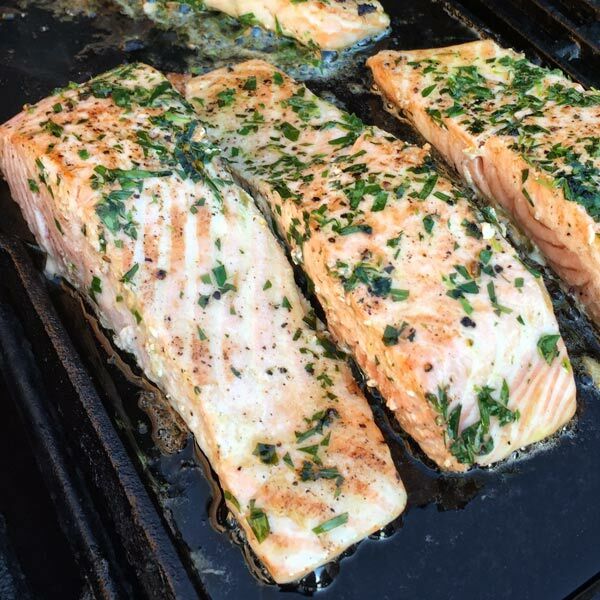 Salmon grilled with Tarragon Butter is simple to make and it’s a play on a very traditional French flavor combination – salmon, butter, tarragon – that manages to be light, refreshing, and gorgeously elegant straight from the grill! This is a dish I pull out when “the boss” comes to dinner, because it never fails to impress. 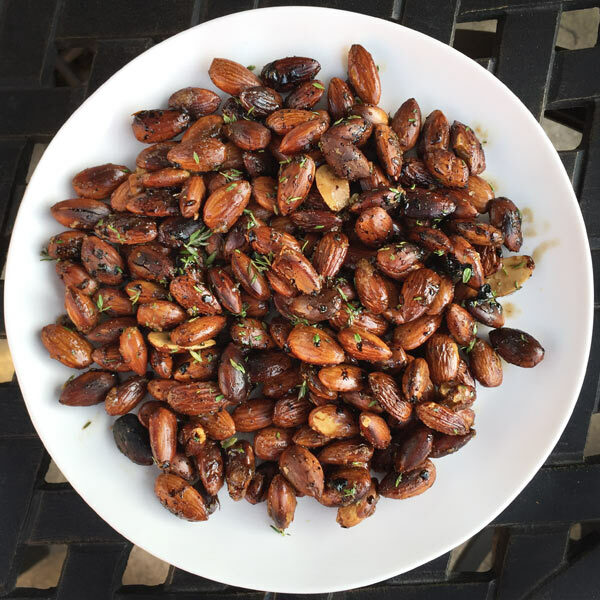 Almonds on the grill? Yes, Susan has us make these while the grill is heating so that when guests arrive, they’re the perfect appetizer all ready to go. They disappear quickly so make sure to make plenty. I love the sweet potatoes with quail eggs – it’s like adult kid food! There they are, those sweet little eggs, nestled in a bed of grilled sweet potato. It’s a marriage made in heaven…you HAVE to try it (I was surprised how easy it is to find quail eggs in Los Angeles. Look in Asian markets, farmer’s markets and Whole Foods). We loved this crazy combination because it made us smile while we were making it and before we tasted it. And then, oh wow! I love these buns from FRENCH GRILL. 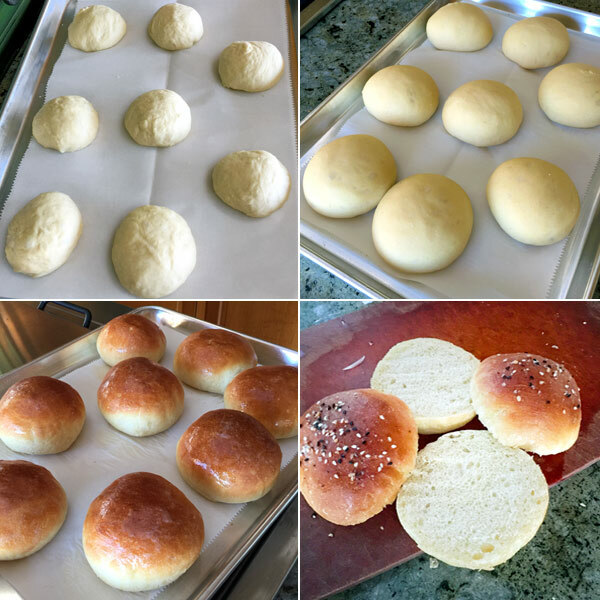 You’ll never buy hamburger buns again since now you can make your own. They truly elevate your hamburger experience (see The Best Cheeseburger You Ever Ate page 135). 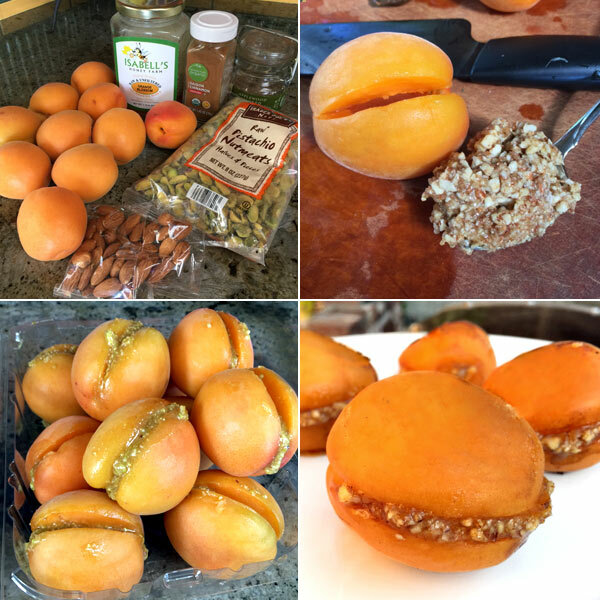 Here, Susan stuffs apricots with a honey and nut mixture which, as she explains, makes the apricots themselves turn to honey on the grill, though they retain a certain tartness that complements the exotic filling. She calls this recipe a deconstructed apricot tart. I call it simply divine. 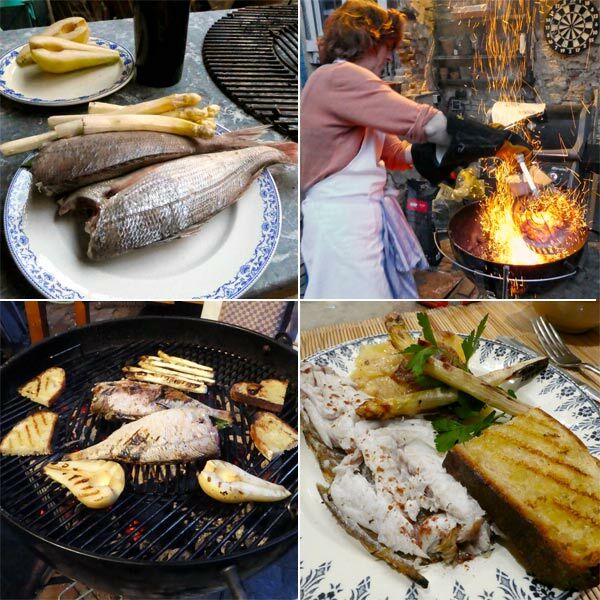 So I had my choice of recipes to feature of course…from grilled pork shoulder to a fancy grilled artichoke. But I chose this because it’s tomato season and those from my farmers’ market are the best ever. Once you get your heirloom tomatoes all you have to do to make this simple – and remarkable – French classic dish. Susan suggests when you core the tomatoes to remove just the very core without making a huge hole in the tomato. Salting the tomatoes firms them up and seasons them through. These cook surprisingly quickly, and the tomatoes get quite soft, which is what you want. Transfer them carefully from grill to plate or platter, using tongs and a metal spatula. Don’t be concerned if the skin is quite dark. Because as you devour the inside of the tomato and its flavorful stuffing, you’ll find that the skin stays right on your plate, easy as pie. 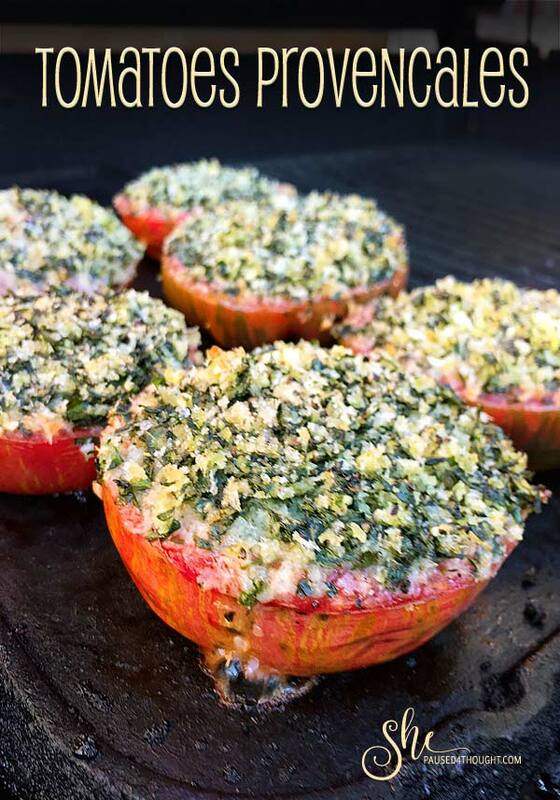 Tomatoes Provencales on the grill – tomatoes topped with an amazing savory blend of basil, thyme, garlic, breadcrumbs and olive oil - exemplifies the best of summer bounty. Sprinkle the tomatoes evenly with the salt (you may or may not use all of the salt, but give them a nice, even sprinkling). 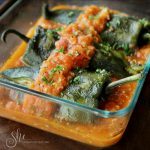 Place them, cut side down, on a wire rack over a baking pan or nonreactive surface, and let the tomatoes drain for 30 minutes. Mince together the garlic, basil, and thyme. Place the mixture in a small bowl and whisk in the oil, then the bread crumbs, to make a thick paste. Preheat all three burners of a gas grill, or build a medium-size fire in the barbecue. When the coals are red and dusted with ash, spread them in a tight, single layer, leaving a perimeter of grill with no coals under it; they need to emit concentrated heat. Set the grill over the coals and set the grill pan on top. Turn the tomatoes cut side up. 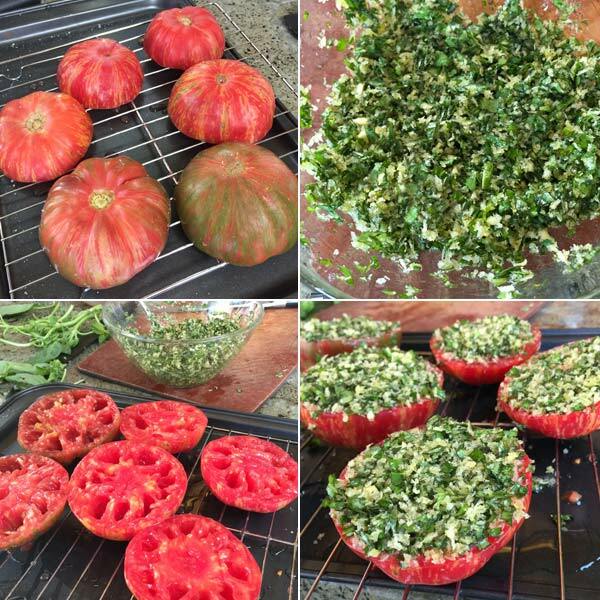 Spread each tomato with the herb mixture, letting some fall into the cavities left by the seeds and spreading it evenly over the cut side. You'll have plenty use it all. When the grill is hot, set the tomatoes on it, cover the grill, and cook until the tomatoes are bubbling on top and the bread crumb mixture is golden, 10 minutes. Transfer the tomatoes to a platter, season with pepper, then let sit for at least 10 minutes before serving. I have learned so many of my culinary skills from Susan. She is full of wisdom nuggets as well. Her classes and books are informative, delicious and fun. Susan will be teaching at my house in November and you can sign up here. Classes sold out quickly last year so don’t miss out if you are interested. 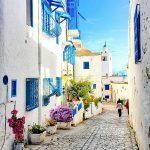 Check out her other Cooking Classes in France as well. Disclosure: I did recipe testing for this French Grill and was sent a copy of the book by Workman Press. 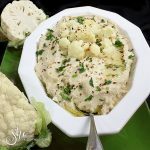 It is simple and bursting with flavor so I do hope you try it! 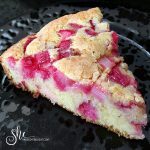 Fabulous recipe!! Going to try this! Looks like it tastes incredible!! Thank you for sharing. Thanks Pamela, I think you are really going to enjoy this recipe. Let me know how it goes. Well, I simply must have this book! I dream of attending a cooking class On Rue Tatin. Everything in your post looks just delicious ~ I can’t wait to try the heirloom tomatoes, which are at the glorious height of their season at our farmers markets … and grilled almonds??? I’m sold!! Sue you would LOVE this book. Until you can get to On Rue Tatin, you can take one of Susan’s classes in November at my house. Loved to have you here. ALL of these recipes look SO good. 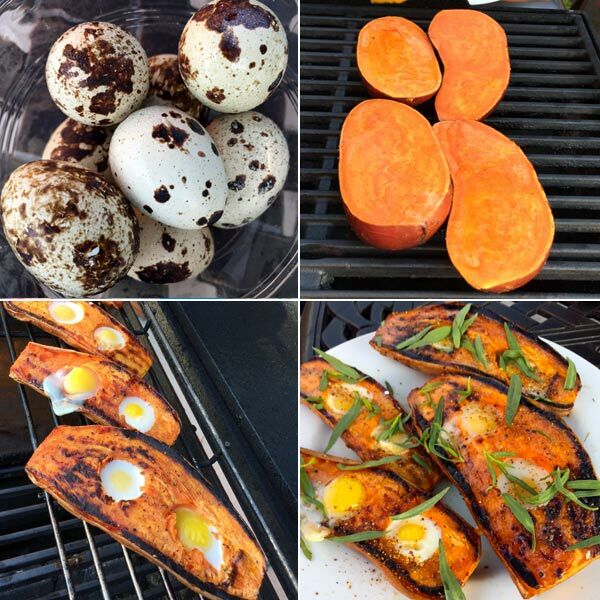 Those sweet potatoes with quail eggs are so cute – what a great idea. And I always loved tomatoes provencal – they’re so pretty. Clearly this is a great book! It’s on my list. All of the recipes I have made in this book are great. Yes, we loved the sweet potatoes with quail eggs is such a clever idea, and tasty as well. I saw these on facebook and droooled!! What a simple, yet impressive way to serve tomatoes! I am terrible about grilling, but it’s probaby because we don’t have a nice grill 🙁 This book would incentivize me to get one, though, I’m sure of it! Oh my, I don’t know how we would get through the summer without a grill. We use it every weekend. 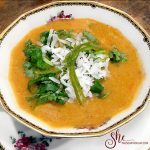 Susan’s recipes are perfect for people want manageable recipes that are full of flavor. She does some amazing combinations. I hope you get a new grill and this book!